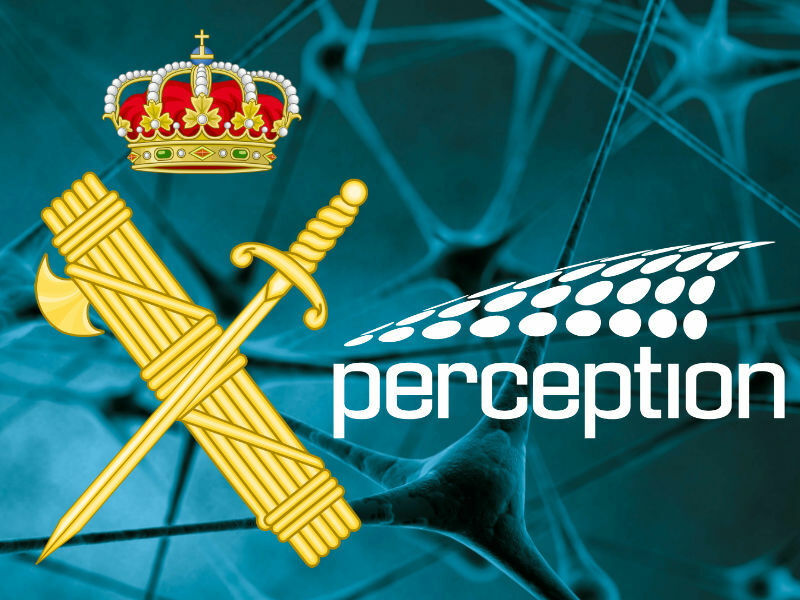 The Spanish Guardia Civil has chosen Chemring Technology Solutions’ Perception Cyber Security to protect its critical network assets from cyber-attacks, as well identify malicious insiders or other vulnerabilities within the network. The new contract follows a successful product evaluation by Perception and its Spanish partner Eleycon21. Perception was originally developed for the UK Ministry of Defence and is the world’s first bio-inspired network security system. Once deployed, Perception will complement the Guardia Civil’s existing computer network security systems by identifying the potential threats they cannot. As Perception is a network behaviour analysis system, it has no rigid “rules-based” architecture and adapts to the network’s changing profile to automatically identify malicious activity, making it more difficult for malware to evade detection. It will also detect the slow, unauthorised external extraction of information from the network, even when sophisticated obfuscation techniques are used. WannaCrypt (aka WannaCrypt0r, WannaCry, Wcry) is a type of ransomware that proliferated very rapidly, with reports that it had affected several high-profile organisations as of 12th May. Put simply, ransomware is an attack that encrypts files on a machine so they can’t be used, then demands a ransom be paid for them to be decrypted. These types of attacks are common, but this month’s attacks in particular are noteworthy for a number of reasons. Typically ransomware is what’s known as a Trojan, delivered via email, requiring hundreds of thousands (or potentially millions) of malicious phishing emails to be sent with attachments or links, and affecting those unfortunate enough to open the attachment or link. WannaCrypt had an additional capability, a self-replicating payload (known as a worm) that meant that once it was in a network, it was able to propagate to other machines on that network. In action, this meant that it only took one person in a business to be affected before everyone in that business was also affected. The worm also has the ability to self-replicate to other networks via the internet, depending on that network’s configuration. There are multiple conflicting reports on whether WannaCrypt was delivered via email or another method, however, the large impact on businesses was largely caused by the self-propagating addition to the ransomware since several machines could be taken out of action if only one machine was initially infected. The self-propagating fragment of the ransomware uses a vulnerability that was discovered by the US National Security Agency who also developed an associated exploit. We do not know how long they knew about the vulnerability, but unlike security researchers the NSA tend to keep newly discovered exploits to themselves in order to use them for intelligence activities. The particular exploit used by WannaCrypt was used internally as part of a toolkit codenamed ‘EternalBlue’. Last year the NSA themselves were hacked by a group called the ShadowBrokers, who released details of EternalBlue to the public in April, which is why we are now seeing malicious attacks using the same methods. WannaCrypt can affect all unpatched versions of Windows from XP to Windows 8. Microsoft had patched the vulnerabilities exposed by EternalBlue in March before the exploit was publically released by ShadowBrokers and in the wake of the attack Microsoft released patches for unsupported versions of Windows (this is rare for Microsoft to patch older versions of Windows, but they did so due to the large scale impact of the WannaCrypt attacks). Multiple organisations were affected by the attack, however it is not yet known (and unlikely we’ll ever know) if these were targeted directly or just randomly happened to be affected. These include Telefonica in Spain, Fedex in the US and the NHS in the UK to name but a few. Remediation and disaster recovery strategies were put in place in affected businesses, such as turning off all IT equipment and rolling back to pre-attack backups, actions which were hugely costly to those affected and may result in a loss of data in the organisation that may not be identified immediately. As WannaCrypt started to spread uncontrollably, cyber security researchers started digging into the malware to see how it worked. One of these researchers, MalwareTech, noticed that WannaCrypt contacts an external website before activating on a victim machine, however, when they looked to see who owned this domain it was unregistered. They thought it would be useful to register this domain so they could understand how many connections it was receiving and consequently be able to estimate how many machines were being affected by WannaCrypt. In an odd turn of events, WannaCrypt stops running if the domain has been registered when the malware starts running, therefore stopping the malware activating on internet-connected devices that were subsequently hit by it. There’s many reasons for putting this ‘killswitch’ mechanism in malware, the leading theory is that it’s a way of understanding if the machine it’s affecting is being used in a test environment. Since these test environments seldom have internet connections for security reasons, the malware is able to hide from the tests by not activating if there’s no external internet connection. By registering this domain MalwareTech may have vastly reduced the infection rate of the initial version of the malware. That’s not likely the end of the story for WannaCrypt, in the weeks since the initial infections were identified, variations with alternative killswitches have been created, and there’s even some variations with the killswitch removed entirely. In essence, WannaCrypt is a combination of two attacks, Ransomware and a self-replicating worm; both of these attacks will continue to be produced by malicious actors. So what can we do to stop these types of attacks going forward? It goes without saying that good security procedures need to be adhered to, keep updating software as soon as possible and make sure not to open links or attachments we weren't expecting to receive. From a business perspective the same advice applies but in situations where older software must be used, for example to control systems that have lifespans of several decades, a method must be in place to identify these vulnerabilities and put protections in place to stop them being attacked. Tools such as Perception can identify vulnerabilities on a network before they are attacked, giving businesses the chance to protect themselves where software updates aren’t possible. If the worst does happen, these types of network monitoring tools can alert an analyst to exactly which files have been encrypted, and which hosts have been affected, assisting greatly in remediation activities. The BBC consumer advice show, “Watchdog” found hundreds of examples of customers being billed for food that they didn’t order via the restaurant delivery app Deliveroo, forcing the foodies-favourite business to deny that is has been targeted by hackers. The company claimed that the fraudulent orders were made using credentials stolen in other attacks, and only worked on customers that used the same email/password combination for their Deliveroo account. The customers contacted by the programme, which aired on the 23rd November (you can watch it on iPlayer here until the 23rd December if you are in the UK) all had their money refunded, which is good news, but we don’t know how much has had to be forked out in refunds to affected customers. Deliveroo have since denied that any payment information had been taken, and the transactions were made using a one-click style payment process that doesn’t require customers to input their payment information again for every order. The advice remains that any online accounts should be protected by a unique password. Although this can rapidly become unmanageable, several password managers are available to stop you forgetting unique passwords for that one website you only use once a year and you’re never going to remember. Apple users can use iCloud keychain, although cross-application support is often lacking, and several Perception staff members use and can vouch for 1Password. The use of stolen credentials raises an interesting issue for businesses online. Deliveroo obviously benefits from a massively streamlined ordering process, however, is this done to the detriment of security? Deliveroo have stated they will ask for verification when orders are made to new addresses, which should help to stop the fraud entirely (although it still leaves doors open to send as much food as possible to a hacked customer's genuine address in the weirdest hacking prank ever). If Deliveroo is able to prove where the passwords were stolen from, should they be able to make a claim against that organisation since it was technically their fault? Should every breached company be forced to immediately contact all customers and let them know a single password is no longer usable on any other sites? The European Banking Authority plans to regulate two-factor authentication on all orders over €10 in the near future, but already that has many businesses favouring one-click ordering up in arms stating more business will be lost than the savings made on fraud refunds. Perhaps the responsibility of security lies solely with the consumers themselves, those that reuse passwords only having themselves to blame; we can hardly expect businesses to check all new accounts against haveibeenpwned.com and refusing service to those that have been hacked in the past, can we? Security experts have disclosed 3 vulnerabilities in Samsung Knox, a piece of software deployed on phones to separate personal and professional data for security purposes, according to Wired. The Israeli security firm Viral Security Group exposed the flaws on a Samsung Galaxy S6 and a Galaxy Note 5, which allowed full control of each device. Considering the purpose of the software is to maintain the security of a business issued handset whilst allowing the flexibility of a personal device, the businesses that deploy this system may be assuming that these devices are safe despite moving between internal and external (protected and unprotected) network connections. It's important to note that these vulnerabilities have since been patched in a security update, however, before the patch the researchers at Viral Security Group were able to replace legitimate applications with rogue versions, with access to all available permissions, without the user's notice. Many businesses rely on the Knox software to make sure any connection to a business network is made from the "safe zone" of the phone, and once outside of it's protective environment the personal segment of the phone is used. If movement between these two parts of the device's software is breached the protections are essentially useless and the device once again becomes a BYOD-type threat. The take-away from this all is that you can't assume your security measures are foolproof, once protections are put in place, a significant responsibility still lies with understanding, controlling, and analysing network traffic. The full white paper describing the flaws is well worth a read if you have time, but first make sure any devices on your network have fully up to date software. The attack that resulted in Bangladesh Bank losing $81 million (and nearly losing a further $850 million and $870 million in a foiled later attempt) has also affected other banks, Reuters reports. According to the new information, SWIFT has sent messages to banks around the world of new breaches, but doesn't specify to what magnitude these breaches occurred. It has, however, suggested that banks increase their security, and to stay particularly vigilant of activity via the SWIFT system. The message later stated that, "The threat is persistent, adaptive, and sophisticated - and it is here to stay." The original attack on Bangladesh bank used the SWIFT messaging system to transfer funds away from the bank, using malware on the bank's SWIFT terminals. The original injection was via a network switch, and SWIFT have since stated that this switch and other use of legacy networking gear that was to blame, rather than SWIFT itself. The new victims all shared one thing in common: Weaknesses in local security that attackers exploited to compromise local networks. SWIFT has responded with security updates to it's software, but if local security is still lax, and banks don't upgrade to the new software (they have no obligation to), then these attacks may keep occurring. With so much money on the line, we may see financial institutions deploying more network security tools, and upgrading their switches, in the next few weeks. We're delighted to announce that we're growing our Perception team! Perception is currently looking to hire two new people to join a rapidly growing business area with the feel of a start-up and the support of a multinational defence company. Both of these positions are based at our Roke Manor site, set in the Hampshire countryside just outside of Romsey, containing some of the most beautiful scenery for any workplace in the country, as well as facilities such as a full gym, tennis courts, cricket field, bar, restaurant, coffee shops, and a snooker room. If you're interested in working in the world of cyber security, take a look at the roles below. This is an exciting opportunity to join a strong team of developers and analysts and be involved in both the development of the platform and the analysis of the output from live deployments. You'll be working on analysis of live networks, as well as development of analyst-focused features in the product itself. The role requires an understanding of networking technologies and protocols combined with software development skills. Emergency services technology specialist j3llyh34d 1ndu5tr135 ("Jellyhead") has signed a deal with Chemring Technology Solutions to become a value added reseller for Perception Cyber Security . j3llyh34d currently provides cyber security services to several UK police and fire services, and Perception will complement its customers' existing computer network security systems by identifying the potential threats they cannot. Simon Twigg, Managing Director at j3llyh34d, said: "Perception is a revolutionary approach to dealing with advanced threats such as zero-day vulnerabilities, targeted vectors and blackmarket rootkits, as well as information leakage. We are delighted to partner Chemring Technology Solutions in the delivery and support of this game-changing technology. Perception is the first security solution we have seen that gives the good guys a sustainable advantage over the bad guys. We believe the security landscape will be profoundly and irreversibly changed by this lateral approach." As Perception is behavioural it has no rigid "rules-based" architecture and adapts to the network's changing profile to automatically identify malicious activity, making it more difficult for malware to evade detection. It will also detect the slow, unauthorised external extraction of information from the network, even when sophisticated obfuscation techniques are used to evade traditional rule-based security defences. Daniel Driver, Head of Perception Cyber Security at Chemring Technology Solutions, said: "j3llyh34d have proven their in-depth knowledge of a very technical area, and share our passion for solving some of the toughest problems in cybersecurity today. We believe they have the capacity and the knowledge base to provide significant value to their customers using the power of the Perception technology."